You may well wish to import your address book(s) from another mailer into MailCOPA. Unfortunately, there are many different formats for these, and it is impractical to import them directly. However, CSV (Comma Separated Values, sometimes known as Comma Delimited) files are a standard format for export from and import into databases and spreadsheets, and thus an excellent intermediary between proprietary formats, enabling such things as address books to be moved between applications. MailCOPA supports import and export of address books using this format. The file extension is usually .csv; sometimes .txt is used, but this is unimportant as long as the internal format is correct. Note that the first line is a list of the names of the fields in each record, and the subsequent lines each contain one record. Each field is separated by a comma - some applications will produce a file where the separator is not a comma, for instance it may be a tab. If this is the case you can use "Search and Replace" in a text editor or word processor to change the separators to commas. Be sure that, if using a word processor, you save the file as a text file (.TXT or .CSV), rather than in a document format. The first thing to do is to export your address books from your current mailer as a CSV file - many mailers support this. If yours does not, try exporting into a database or spreadsheet format that you can open using the appropriate database or spreadsheet software, and save again as a CSV file. 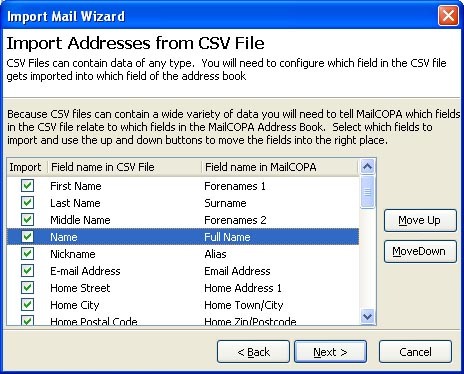 Next, you must ensure that the field names used in the CSV file are related to those used by MailCOPA. Click on a hotspot on the image below for more information. The addresses will be imported into a new book whose name will be the same as the source .csv file.